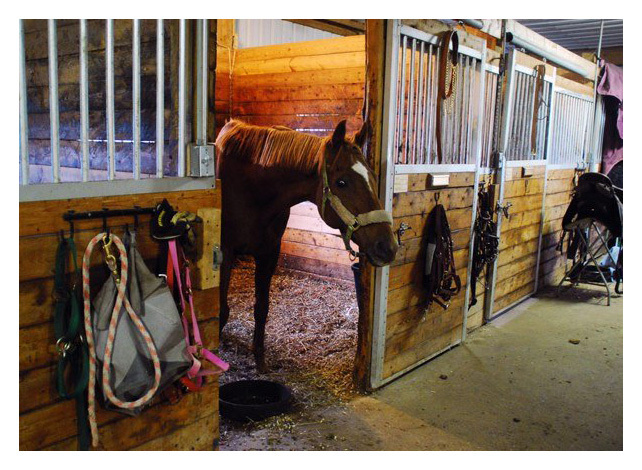 Stabling your Horse: Good or Bad ? 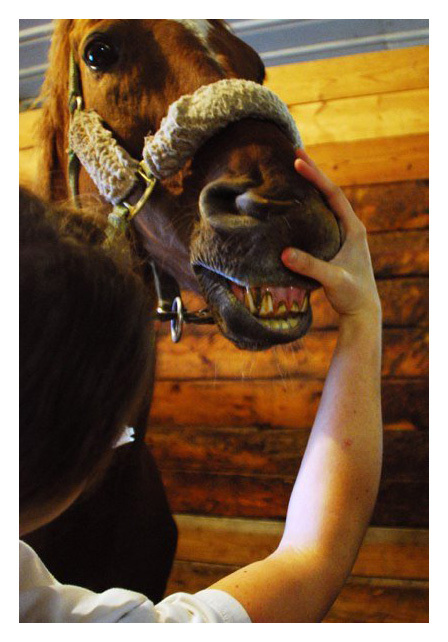 Here at the Adirondack Equine Center, we've been asked this multiple times before. It is always difficult to explain the reason why horses should not be stabled under normal weather conditions. Common fears for stabling horses are to avoid injury (scrapes, cuts and various other abrasions) Our guests and riders, (most of the time) are laymen in regards to proper horsemanship. We take the time and effort to explain the differences between horses stabled for long periods of time and horses that roam free on pasture. 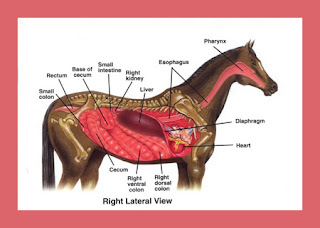 Cribbing or scientifically "aerophagia" is a psychological "vice" or habit that originates from boredom and quite often, from stomach ulcers in stabled horses. Many show horses, race horses are kept in stalls, and allowed only one to three hours of turnout daily. The process of cribbing is when the horse gnaws on the interior wood of the stall, rail or tree stump and inhales air into the stomach. This action promotes the release of endorphins, which promotes the continual recurrence of episodes.This can be compared to the nail biting habits that children and adults develop over years from a variety of psychological factors. In our case, nail biting results in a mild infliction of pain, resulting in an endorphin release. Colic is another condition that increased mortality in horses. With the right management practices, colic is a preventable condition that affects a large percentage of horses, and when not treated, it poses a high mortality risk. To avoid colic, it is best to have clean water available to the horse 24 hours a day, 7 days a week. It is also recommended to feed your horse a soft pelleted feed, which can also be in the extruded form, to ease digestibility. When we feed our horses pelleted feed, we ensure to add a little water to it to soften it and to avoid the incident of choke. The logic is that if the pellet can crumble in your mouth without consistently chewing it, the easier it will be for your horse to digest it. We do not feed whole oats, chaffed feeds, and other substrates such as sugar beet to our horses. We will discuss the to do's and dont's during a colic emergency, in a separate post. "The study shows that allowing or not allowing (turnout) and the particular time of turnout affects the behavior of horses in the sable as well as those in training," Werhahn explained. All in all, she noted, horses' stall and training behavior was more relaxed when turnout was allowed. "We conclude that owners should try to allow free exercise," she added. "The best particular time of turnout is very individual for each horse and rider combination. Very 'active' horses might be more concentrated in TBT. More phlegmatic horses might be easier to ride in TAT. But this is very individual." "No Hoof, No Horse" - The lack of movement reduces the blood circulation thus less nutrients will be supplied to the hoof. 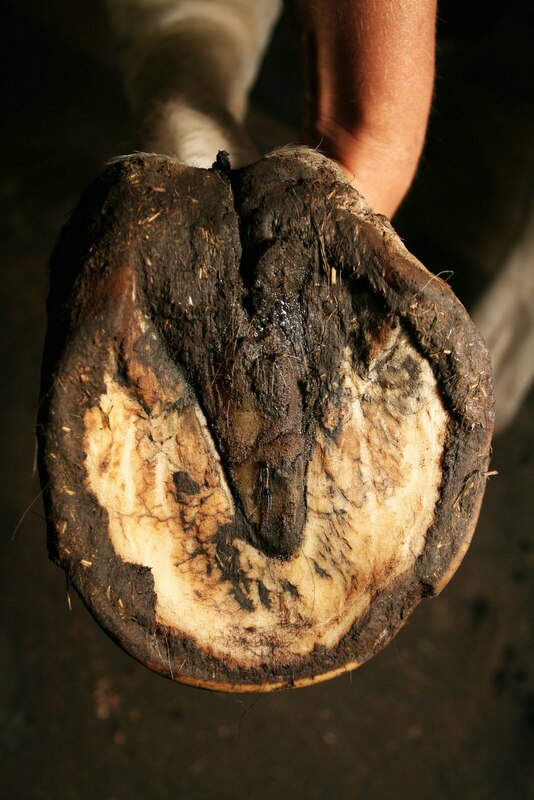 The stall must be kept well ventilated, dry and have some type of support such as mats or sand/gravel mix under shavings to stimulate the hoof wall from becoming too thin or brittle. 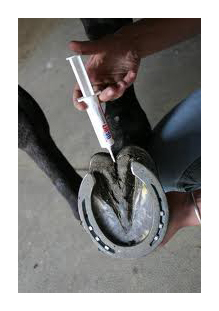 Many stabled horses suffer from thrush and other fungal/bacterial infections that take treatment and time to cure. Have a central sulcus infection ? 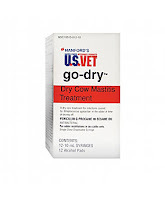 Try the penicillin based treatment for mastitis in cows. We have horses at the farm that can only be stabled in a group of two to three together. Otherwise one or the other will damage the stall by kicking at it, turn up the dirt or mats and continuously display some type of psychological trauma throughout the time that the horse is stalled. It is very stressful for many horses to be confined as they are claustrophobic by nature. To Wear or Not to Wear .... ? There is a debate on whether healthy horses should be wearing blankets. To be honest, there is nothing nice about having a wet back, during a wet winter storm - so this is one of the reasons for which horses should be wearing "weather protection". 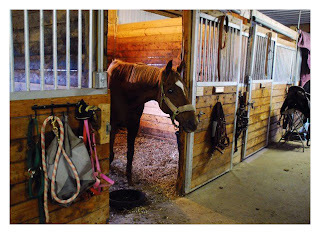 Many horses also lack the common sense to realize that they may always come into a run in shed or an outside stall, and keep themselves dry and warm - so what do we do ? Make them wear blankets ! The coats usually have between 400g and 500g of polyfil and an outer shell of 1200 to 2000 denier (same denier as used by the military in 1940's)breathable and virtually waterproof. I personally had never seen nor heard of a horse blanket harming a horse (tying of blood flow, etc), if a horse rips it, it usually falls off without major consequences. 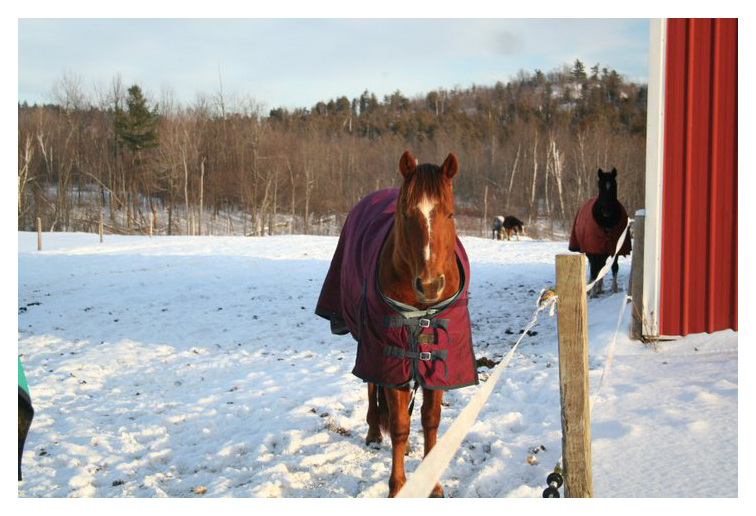 It is suggested that blanket wearing horses should not be turnout out into large paddocks or pastures where they cannot be checked on several times a day. 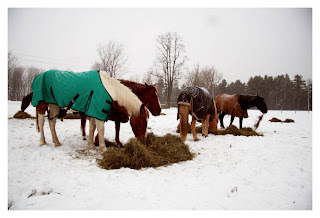 Horses are not susceptible to cold temperatures, even in the -30's, as long as their backs are dry, the coat is long, they have protection from the wind and elements, and most importantly, they are well fed. Hay, as opposed to grain and oats, provides the most long-term energy burn to keep the body warm. 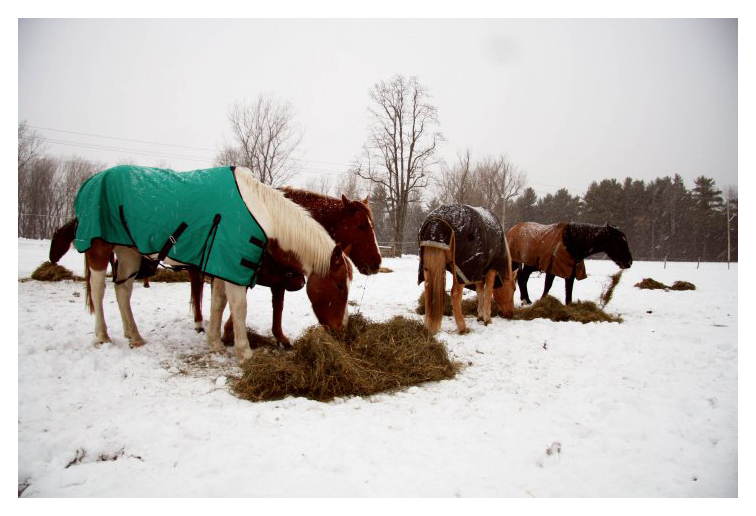 With the added insulation of a winter blanket, the horse will preserve its energy longer, thus saving the horse owner $ on hay,(in which this economy demands) and the horse will be more comfortable during the drastic temperature drops. The following Purina Mills Horse Newsletter will explain how a warm-blooded animals' critical temperature will change from season to season and how we, horse owners, need to assist our equines to weather the winter days ahead - Winter Care for Horses For even more physiological reference you can read The Horse Magazine article: Formidable Frostbite. When the -30's and -40's finally DO come along, we double blanket and we place heat lamps in the stalls to increase the temperature of the stable. 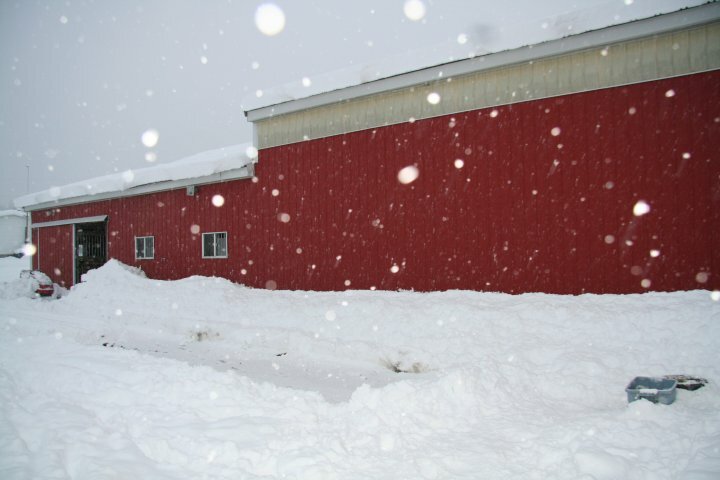 Now.. you definitely do not want to allow to keep your indoor arena or your equine facility at a much higher temperature than the outside (unless you have show horses, and you turn them out only an hour or two a day, with having the additional in stall, uva/uvb lighting available), due to the fact that horses will become susceptible to the winter high's and low's. The ultraviolet light dictates the growth of a horses' hair coat. 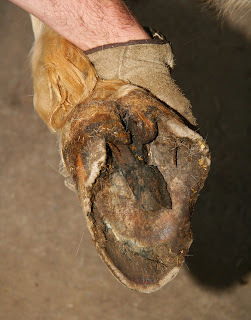 If your horse does not shed easily in the spring/summer, there may be another reason for it, such as Cushing's Disease. 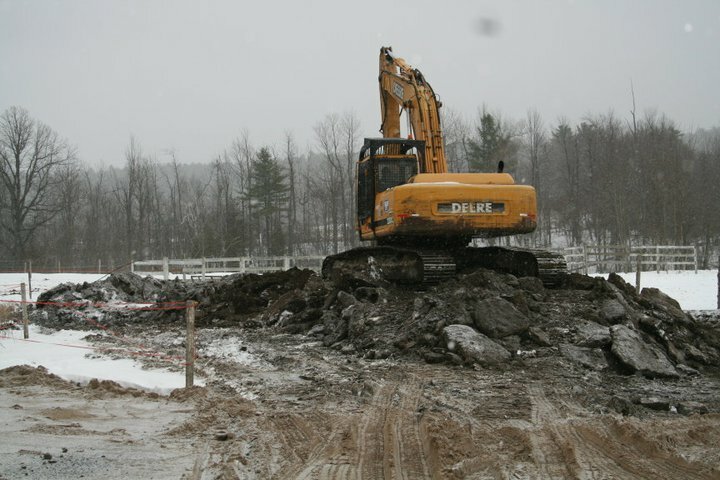 When feeding horses in the winter, you want to ensure to increase their caloric intake. This can be done by adding additional fat as a supplement to the feed, or look for pellet that already includes a higher percentage of fat - usually between 8%-20%. Think: Would I drink a cold beverage in the middle of winter, provided I am outside and not inside my 75-80 degree home? No, I would not. Cold drinks cool you down in the summer, for am moment, that is why when we sweat or feel hot, we drink more cool water = hydration. When we go through winter, we drink more if the beverage is warm or hot, as it warms us up for a little while. Granted, this is not the same as caloric intake and keeping your body functioning during winter months, it is simply a way to remain hydrated and thus, have heat delivered to your extremities. As always, stay in touch and watch our Facebook for updates ! How young is too young ? Here, at the Adirondack Equine Center, we hear this question very often. So how young is too young? This all depends on the development of the child, not necessarily the age. Many horse owners find that the younger the children get acquainted with equines, the better riders they will become later in life. Horseback riding develops many crucial skills such as balance, coordination, and most importantly, the ability to concentrate on one thing for longer than five minutes ! Riding horses also prepares children for doing other, attention based activities, such as driving an ATV, dirt bike, and later, a car. The younger they are, the quicker they learn, and are less exposed to any biased information, as one would, later in life. The trick is not to "over think" anything that you are attempting to accomplish, if you over think a simple activity such as riding, or driving, the more likely you will fail at what you'd like to achieve. Children, as a general rule, are less nervous, perhaps due to their inability to differentiate between risk and danger. I believe that this ends somewhere around 8 years of age :) Once they realize that they can fall off and potentially hurt themselves, the imagination runs wild. We take kids as young as four years old, sometimes younger, depending on how well they can demonstrate balance and coordination. What we do is we attach shorter stirrups (amusingly named "little dudes") to the horn of the saddle, place the child into the saddle, and secure him or her properly. When ready, we attach a lead rope to the horses' halter and off we go, walking by the young one's side to ensure they will have a good and safe ride. Do you have a child's rate for horseback riding? 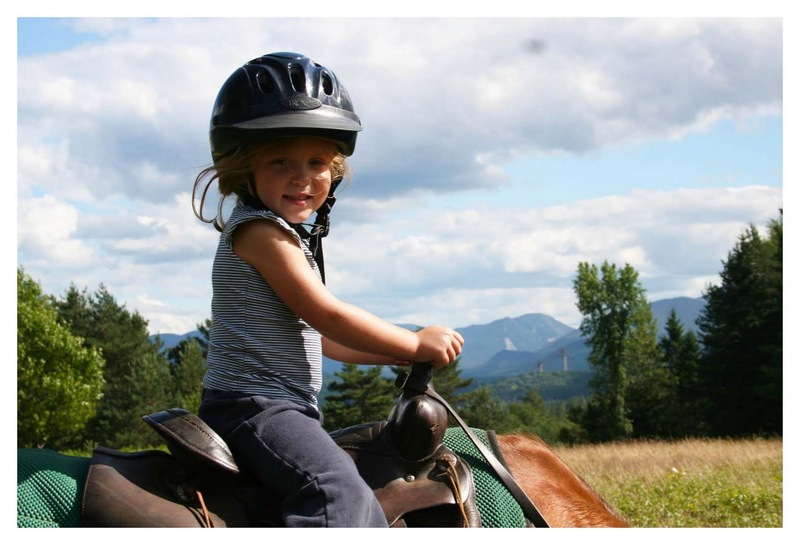 Unlike restaurants, where children eat free or at a reduced rate, our liability rate increases when kids are involved with horseback riding. 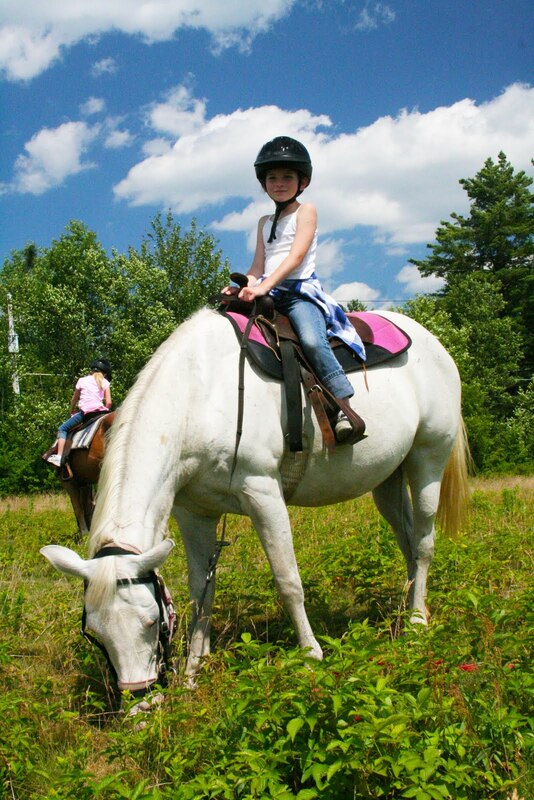 We take the extra time and effort to make sure that your child has the best possible experience on horseback. 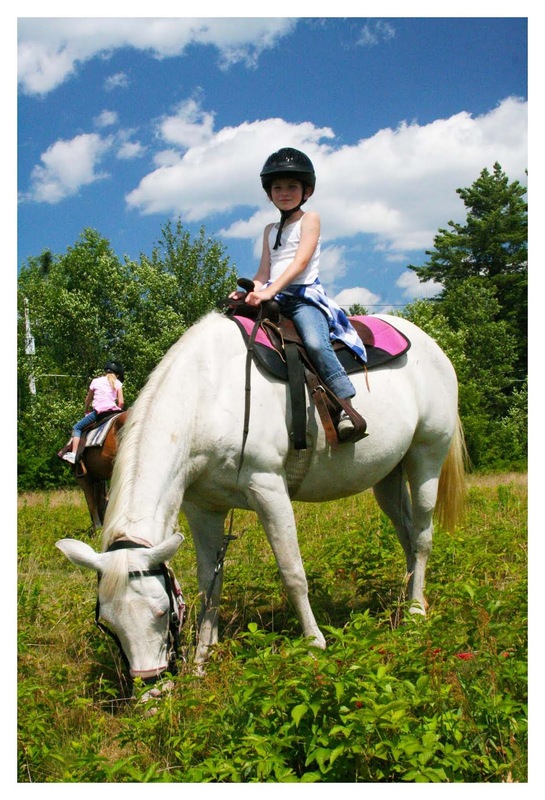 Children also cannot ride tandem with their parents due to liability reasons - such as - if something were to go wrong, you either have control of the horse or the child, which makes for a very unpleasant experience. So there, we decided to clean up our paddocks and corrals from the rich, tomato growing top soil, rendered over the past thirty (or more) years. As any blogging, eccentric horse owner knows, this type of soil turns to knee deep sludge, depending on the amount of rainfall in the season. Nevermind the fact that an average horse produces 50 lbs of manure a day. We, the Adirondack Equine Center began this blog to have our readers and guests visualize some of the daily responsibilities a horse rescue farm of 36 horses and limited staff, endures. We will try our best not to sound overwhelmingly boring :) Keep in mind, whether the horses work or not, they are all on our rather small budget. The Adirondacks are particularly an "inhabitable"environment for the horse's hoof, inducing rot, white line, central sulcus and other,both fungal/bacterial infections. The space is limited, and many of us, local horse owners are forced to house horses on small acreage or have limited access to acreage due to the topography. The lack of drying, sunny weather, among many other factors, is the least appealing to the horses' health. So.. where is the best place to keep and raise horses ? The answer is: The South, the Midwest. 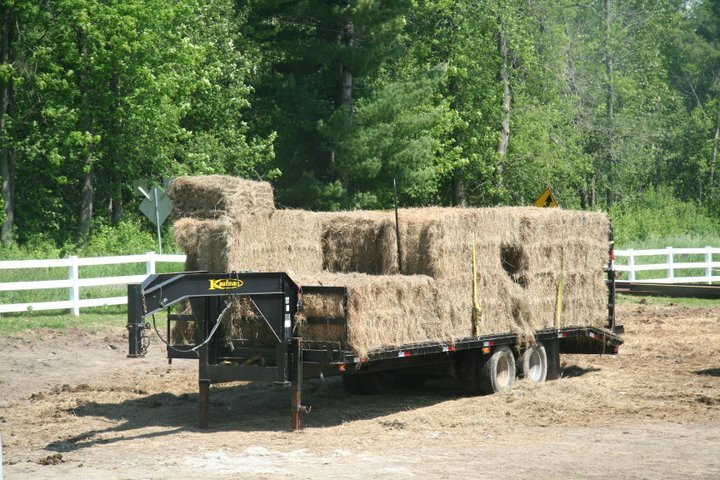 Once you are lucky enoughto be in a "horse state",keep costs low, especially when it comes to forage, find the best hay for the lowest price (unless you own only about one to two horses - then you can splurge !). The drier the State the less likely it will have the most reasonably priced forage. Hay is moderately low in price, but that changes with the increase in fuel prices. More horses = more money spent on forage purchased from other sources than your farm. Casper's foot when he arrived in Spring of 2010 and his foot progressing throughout summer of 2010. You should read this ! 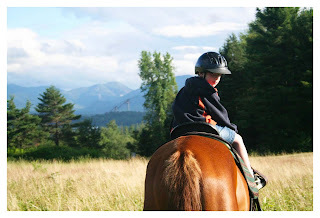 Adirondack Equine Center. Picture Window theme. Powered by Blogger.